How can you tell if your physical therapist or assistant is productive? Productivity has been a hot topic among physical therapists for a while. This article focuses on how to calculate productivity in the outpatient physical therapy practice. What is the cost to the private practice of employing a physical therapist? What is their annual salary, what are the costs to the clinic to provide benefits, and what is this employee’s share of the overhead? Once you know that, you can use reports to calculate how many patients per day the therapist needs to see for the business to be profitable and compare the actual cost of employing the therapist. How to analyze therapist productivity? If your therapists are required to enter both billable and nonbillable time, you have a way to see how they spend their day. If in an eight-hour day with a lunch break, they cannot account for two hours of time (billable or nonbillable), then you have reason to explore how they spend their time during the day. How much is nonbillable time costing you? You can only answer this question by looking at the time therapists spend on administrative tasks that cannot be billed to a client. Consider this scenario: You pay a physical therapist $90,000 per year, plus benefits, vacation, etc. The therapist bills his time at $80 per hour. On average, he is entering about 30 billable hours each week. At 30 hours per week, 50 weeks out of the year, he is billing about $120,000 per year. At first glance, he’s covering his salary, and so you figure he is profitable. The question is are you profitable as the clinic owner? To find out, you need to factor in the rent, operations budget, and ancillary staff salary. Could the physical therapist be more profitable? The answer is it depends. In a typical physical therapy clinic, a physical therapist does much more than provide hands-on treatment, prescribe exercise programs, and educate patients and families, all of which would include billable time. A therapist’s administrative tasks may include follow-up calls to patients, recommending equipment to purchase by the clinic owner, and conferring with physicians and insurance companies. Based on the scenario, the therapist is billing 30 hours a week and spends 10 hours a week on administrative duties. Which administrative duties could be assigned to the trained administrative staff to free up the therapist to see more patients? 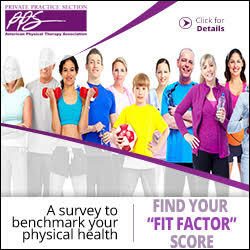 For example, in my clinic, I have one of the administrative aides work from an initial evaluation report template on the documentation software to enter all medications, patient height and weight (for the body mass index), and pain questionnaires scores. In private practice, efficiency is key to productivity. For example, every office needs someone handling scheduling who will work to minimize cancellations and no-shows with timely calls or reminders to patients. Productivity in physical therapy clinics varies. Some clinics define productivity in terms of percentage while others use metrics that work better for them. The question is what works best for your office? The continuing changes in the health care industry will affect how we work and also the way we measure productivity in private practice. Olajide Kolawole, PT, PhD, is a PPS member and owner of Kebe Cares Physical Therapy in Fayetteville, North Carolina. He can be reached at ola@kebecaresphysicaltherapy.com.